I’ve been eating this all day, err day. Actually I’ve been eating this for breakfast. Occasionally. BUT! It’s really quite good and the texture is fantastic. 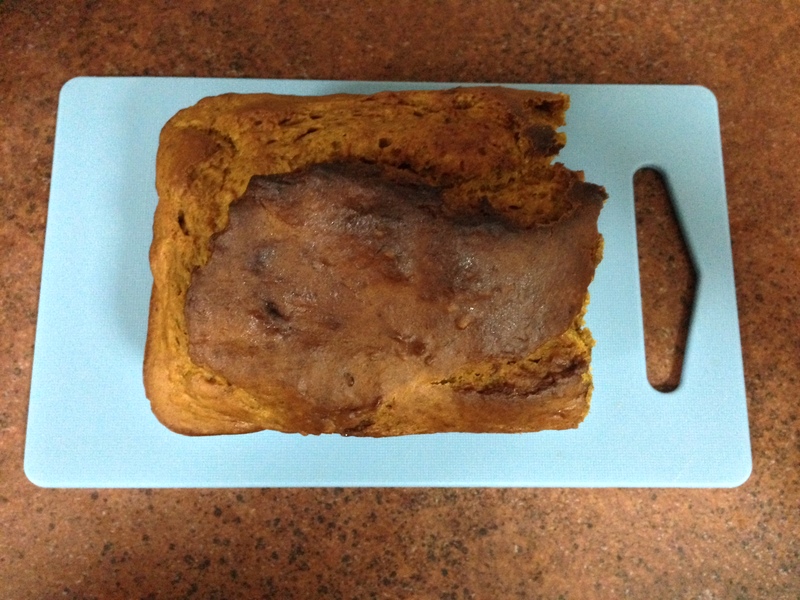 This bread came to be because I bought a tin of canned pumpkin and a jar of pumpkin spice. I made a pumpkin latte and then stared at both ingredients and realized I had made a fatal error in judgment and was not going to be able to finish either. Ever. I also realized I had greek yogurt in the fridge because I had been on a smoothie making frenzy over the weekend and decided I needed to use that up. And all the bananas I froze for the smoothie making frenzy. I found this bread online and voila! Preheat your oven to 175 degrees celcius. Mix the flours, baking powder, baking soda, salt, cinnamon and pumpkin spice in a bowl. Whisk the brown sugar, pumpkin puree, bananas, eggs, yogurt and vanilla extract in another large bowl. Mash the bananas separately, first. Pour the mixture into a greased 9×5 inch loaf pan. Bake for 55 minutes. Toothpick/knife will have a bit of gunk on it but its fine. *This bread isn’t very sweet so I like to spoon a tsp of maple syrup on it and let it soak in before eating. u finally did sth with the pumpkin~! I did! But the rest is still in my freezer. Any thoughts?